Pure even in its name: The Puro toilet paper holder by Radius Design has a clear design and it was reduced to the essence. The special something: all kinds of objects find their place on a small tray. 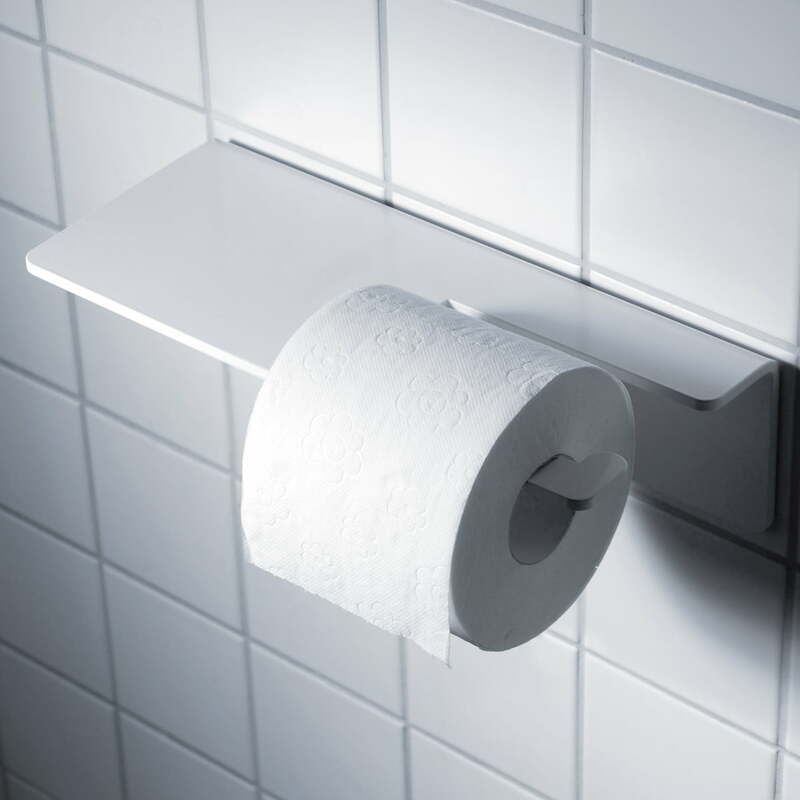 The toilet paper holder by Radius Design easily holds toilet paper: easily placed on it, the rolls are exchanged in an instant. A small hook at the holder holds the paper rolls safely. The special something is a small tray on the holder: additional objects fit on the holder, such as a book or humid wipes. That's how everything necessary is near the toilet. 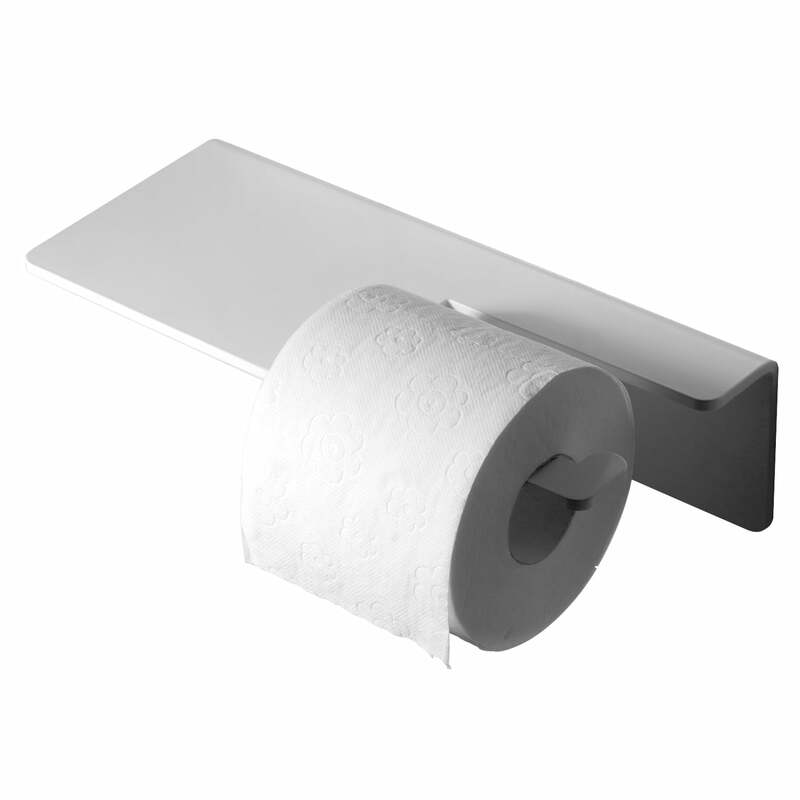 As part of the Puro Collection by Radius Design, the toilet paper holder is also clear and reliable in its expression. Michael Rösing is responsible for the design – he also though about practical aspects in his Puro series: since the toilet roll holders of the Radius Puro Collection are made of powder-coated aluminium and the have spacious shapes, making the bathroom accessories easy to clean and stainless for a long time. It is a nice and solid (made of metal) item for one's bathroom. I like its "raw" look. I have not attached it to the wall yet but I hope it will sit perfectly on any wall surface. I just hope that white colour will stand the same for the all time. Isolated product image of the Puro toilet paper holder by Radius Design in black: The toilet paper holder by Radius Design easily holds toilet paper: simply placed on it, the rolls are exchanged in an instant.